This title was first published in 2003. 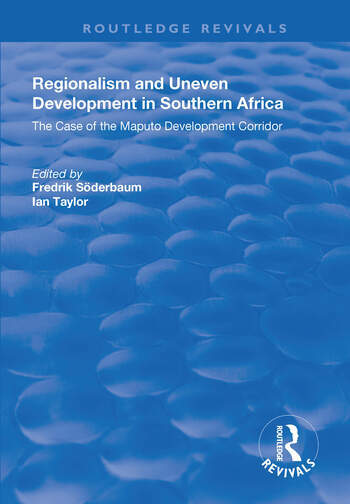 This volume advances our understanding of how Southern Africa is currently being reconfigured, critically examining what has been marketed as the "flagship" of the Spatial Development Initiative programme in Southern Africa: the Maputo Development Corridor (MDC). By examining a variety of cross-cutting levels of governance and development and by focusing on the nexus between the formal and informal processes that stake out the MDC, this volume contributes to a detailed understanding of what is perhaps the most important current experiment in regionalism in Africa. By engaging regional processes on the micro-level and "on the ground", there is a special emphasis on how local communities regard and respond to the Corridor initiative. All chapters in the volume are the result of extensive fieldwork in both Mozambique and South Africa, and the contributions are drawn from the region and beyond, including Botswana, Mozambique, Zimbabwe, South Africa, Sweden and the United States. Contents: Introduction: understanding the dynamics of micro-regionalism in Southern Africa, Fredrik SÃ¶derbaum and Ian Taylor; The Maputo development corridor: progress achieved and lessons learned, Geoff de Beer and David Arkwright; Situating the Maputo corridor: a regional perspective, Daniel Tevera and Admos Chimhowu; The role of the state in the Maputo development corridor, Fredrik SÃ¶derbaum and Ian Taylor; Governance in the Maputo development corridor, Fredrik SÃ¶derbaum; Public-private partnerships and African development: the case of the N4 toll road, Xenia Ngwenya and Ian Taylor; The Mozambique aluminium smelter: partnership for exploitation or development?, James Hentz; A view from Maputo, IraÃª Baptista-Lundin and Ian Taylor; Conclusion, Fredrik SÃ¶derbaum and Ian Taylor; Bibliography; Index.